We began with an inspiring talk from Farzad Mostashari, National Coordinator for Health Information Technology; followed by remarks from Todd Park, Chief Technology Officer of the United States; Peter Levin, Chief Technology Officer, U.S. Department of Veterans Affairs; and Leon Rodriguez, Director, Office for Civil Rights. The ground rules for the event were very much like what participants in unconference style events like Foo agree to: they rely on courtesy and good sense, and operate under what's been called frieNDA. There is the expectation that if someone tells you something in confidence, you will respect that confidence as if it were told to you under NDA. Much of the free interchange that happens at Foo type events comes from people's confidence that they can tell each other things off the record. That being said, there was some robust discussion that I will try to highlight. First the framework for the meeting was provided by hearing from some strong patient advocates with compelling personal stories. Hugo Campos, Regina Holliday, ePatient Dave deBronkart, and Nikolai Kirienko shared with the group and set the tone for the day. 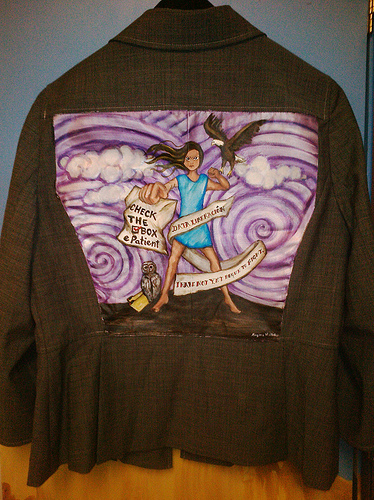 We also got to see Keith Boone's daughter receive her Walking Gallery jacket and I was very impressed by her intelligent and thoughtful words. Get the copy of your record in the way that you want – such as an electronic copy or a paper copy – if your plan or provider is able to do so. "The Right to Access and Correct Your Health Information"
It was great to hear the Director of the Office of Civil Rights, Leon Rodriguez speak about how important this issue is to his office and his office will contact any provider directly who does not comply with patient data access requirements. You can download a letter from OCR he provided at the meeting HERE. Having a legal framework for the technology discussion on how to engage patients and empower them through data access was very helpful. There was a great deal of discussion of Blue Button, and how it has basically come to become a brand meaning patient access. Peter Levin from the VA highlighted the success of the program, and described it's evolution from ASCII text to more structured content, and CMS officials discussed how they are offering their beneficiaries a Blue Button to download their medical records from secure websites. A great many other data providers and data holders have also committed to Blue Button at BlueButtonData.org. But the priority use case identified was the ability to have health data automatically sent to a PHR or other data repository. Patients do not want to keep going back and clicking the download button to get new information. The analogy was drawn towards not downloading and merging excel spreadsheets of banking information but having web applications that allow users to manage their finances by access to real time information from their accounts. One technology project that sprung from the discussion is the idea of allowing automated Blue Button downloads based on trigger events and patient preferences. And not just the VA and CMS but private payers and vendors enthusiastically signed up for the project. I expect this work to show rapid results and am very excited about the possibilities. The Auto Blue Button project will explore both push as well as pull of CCDA possibly using OAuth. As Arien Malec tweeted this could be the easiest way to Stage Two Meaningful Use transmit requirements. There will be some debate on what the best way is to accomplish this, and as the VA and CMS Blue Button are currently creating somewhat incompatible text files. There was some conversation around content standards and the workgroup will need to reach consensus and agree on specifications to move forward. I loved the idea raised of moving beyond "dumb ASCII text files." But I expect this project to gain early consensus, strong specifications, rapid pilot development, and broad adoption. Keep your eye on Auto Blue Button ~ this will be a game changer. There was also long complicated discussion on patient identification, authorization and access. Aside from the discussion with regards to the Auto Blue Button project, there seemed to be consensus that this issue involves cultural and policy implications as much as technology solutions. In discussion I have had with large telecommunications companies who are working in this space I actually expect this issue to be resolved relatively quickly. People already trust their cell phone providers with their identity and this is a natural evolution for them. I expect to see wide scale solutions offered by AT&T, Verizon, and others within the year. This was a very fruitful meeting and a great example of government as a platform for innovation in the role of convening and collaborating. The room only had 80 chairs, and about half of them seemed to be filled with government staff, so obviously not everyone with a viewpoint on the issues discussed could be invited to attend. But I think that they did a very good job of inviting a diverse group of stakeholders and every viewpoint seemed to be represented well. It was time of listening and a call to action. One action already taken is the Advisory Board's new Developer Challenge the "“The Patient Engagement Blue Button Challenge." I expect to see some official blog postings soon highlighting the meeting as well as rapid movement towards forming some workgroups to find solutions to the pressing problems presented. Glad to see some progress on this issue. When I contacted my provider before to download my data, (I was going to put it in HealthVault), they informed me they could not allow me to do it because of their "security" policy which giving me my information would reveal how they structured their data center. I asked for a copy of the policy, and of course, it said nothing of the sort. It was simply classic. Eventually they admitted it was an agreement they had signed with their EHR vendor, not to release the patient data and that it was proprietary. The time is ticking on their non-compliance since they did this. I've been waiting for the system to catch up, so I can't wait to go back and ask again to see what progress, if any their HIT department has to the developments out here. They are facing serious potential penalties for the situation you describe.